Meghan Markle made international headlines when she married Prince Harry of the British royal family and became a Duchess. Millions tuned into watch the 3-hour ceremony. 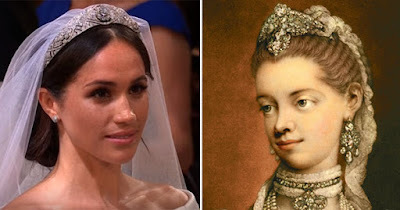 But Meghan is not the first Black woman to live in the Royal Palace. In 1761, Sophie Charlotte married King George II and became the first ever Black Queen of England. But Queen Sophia Charlotte, a descendent of a Black Portuguese family that lived in Germany, wasn’t just the Queen of England; She was also the Queen of Ireland as well. Even more interesting, they got married at the age of 17 and they went on to have 15 children. She was the queen for 57 years. According to Gabriel Scott, historian and author of The Chosen Ones: Perception of Malcolm and Martin, people have tried to discredit and whitewash the significance of her history and contributions to England for many years. However, the truth can not be denied. Queen Sophia Charlotte spoke several languages including English, German and French. She was good friends with accomplished classical composer, Johann Bach and his wife. And she once received a composition in her honor from Wolfgang Mozart. In addition, the city of Charlotte, North Carolina in the United States is named after her in her honor. But most notably, history confirms that she was, in fact, the great-great-great grandmother of the current queen, Queen Elizabeth. Wow! Who would’ve ever thought that the royal family had Black ancestry in their lineage?